McCarthy, J. 1963a A basis for a mathematical theory of computation. In Computer Programming and formal systems. North-Holland. McCarthy, J. 1963b. Situations, actions, and causal laws. Technical report, Stanford University. McCarthy, J. 1977. Epistemological problems of artificial intelligence. In IJCAI, 1038-1044. McCarthy, J. 1980. Circumscription: A form of non-monotonic reasoning. Artificial Intelligence 13(1-2):23-79. McCarthy, J. 1986. Applications of circumscription to common sense reasoning. Artificial Intelligence 28(1):89-116. McCarthy, J. 1990. Generality in artificial intelligence. In Lifschitz, V., ed., Formalizing Common Sense. Ablex. 226-236. McCarthy, J. 1993. Notes on formalizing context. In IJCAI, 555-562. McCarthy, J., and Buvac, S. 1997. Formalizing context: Expanded notes. In Aliseda, A.; van Glabbeek, R.; and Westerstahl, D., eds., Computing Natural Language. Stanford University. Also available as Stanford Technical Note STAN-CS-TN-94-13. McCarthy, J. 1998. Elaboration tolerance. In Working Papers of the Fourth International Symposium on Logical formalizations of Commonsense Reasoning, Commonsense-1998. McCarthy, J. 2002. Actions and other events in situation calculus. In Fensel, D.; Giunchiglia, F.; McGuinness, D.; and Williams, M., eds., Proceedings of KR-2002, 615-628. ^ Lifschitz, V. (2011). “John McCarthy (1927–2011)”. Nature 480 (7375): 40–46. doi:10.1038/480040a. PMID 22129718. ^ Biggs, John (October 24, 2011). "Creator of Lisp, John McCarthy, Dead at 84". TechCrunch. ^ Cifaldi, Frank (October 24, 2011). "Artificial Intelligence Pioneer John McCarthy Dies". Gamasutra. ^ Shasha, Dennis; Lazere, Cathy (1998). Out of Their Minds: The Lives and Discoveries of 15 Great Computer Scientists. Springer. p. 23. http://books.google.com/books?id=-0tDZX3z-8UC&pg=PA23#v=onepage&f=false. ^ a b c Woo, Elaine (October 28, 2011). 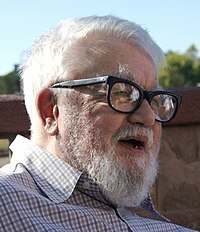 John McCarthy dies at 84; the father of artificial intelligence. Los Angeles Times. ^ Hayes, Patrick J.; Morgenstern, Leora (2007). “On John McCarthy's 80th Birthday, in Honor of his Contributions”. AI Magazine (Association for the Advancement of Artificial Intelligence) 28 (4): 93–102. http://www.aaai.org/ojs/index.php/aimagazine/article/view/2063/2057 2010年11月24日閲覧。. ^ McCarthy, John (1960). “Recursive Functions of Symbolic Expressions and Their Computation by Machine”. CACM 3 (4): 184–195. doi:10.1145/367177.367199. http://portal.acm.org/citation.cfm?id=367199. ^ McCarthy, John (August 1, 1994). "Re: SPACE BRIDGE SHORT". Posting in Usenet newsgroup: sci.space.tech. ^ McCarthy, John (February 4, 1995). "Progress and its sustainability". formal.stanford.edu. ^ McCarthy, John (June 28, 2001). "The Robot and the Baby". formal.stanford.edu. ^ Thomson, Cask J. (October 26, 2011). "The Death of TRUE Tech Innovators D. Ritchie & J. McCarthy – Yet the Death of Steve Jobs Overshadows All.". WordsWithMeaning blog. ^ “IEEE Computer Society Magazine Honors Artificial Intelligence Leaders”. DigitalJournal.com. (2011年8月24日). http://www.digitaljournal.com/pr/399442 2011年9月18日閲覧。 Press release source: PRWeb (Vocus). Philip J. Hilts, Scientific Temperaments: Three Lives in Contemporary Science, Simon and Schuster, 1982. Lengthy profiles of John McCarthy, physicist Robert R. Wilson and geneticist Mark Ptashne. Pamela McCorduck, Machines Who Think: a personal inquiry into the history and prospects of artificial intelligence, 1979, second edition 2004. Pamela Weintraub, ed., The Omni Interviews, New York: Ticknor and Fields, 1984. Collected interviews originally published in Omni magazine; contains an interview with McCarthy. Celebration of John McCarthy's Accomplishments at Stanford University. Oral history interview with John McCarthy at Charles Babbage Institute, University of Minnesota, Minneapolis. Oral history interview with Marvin Minsky at Charles Babbage Institute, University of Minnesota, Minneapolis. Oral history interview with Jack B. Dennis at Charles Babbage Institute, University of Minnesota, Minneapolis. Oral history interview with Fernando J. Corbató at Charles Babbage Institute, University of Minnesota, Minneapolis.